Seeing as you’re here, we know you’re looking for advice on the best tennis ball machine, or rather, your best tennis partner. After a long time of searching and studying, we recognized Spinshot-Player Tennis Ball Machine with Phone Remote Supported is a good choice. With a cool price, it’s suitable for both newbies and professionals as well. Keep following us to know why we pick up this product as well as enquiring about other reviews in this post. From there, you can enlarge your choice to find the one that fits your demand most. How does a Tennis Ball Machine Work? Is a tennis ball machine worth it? 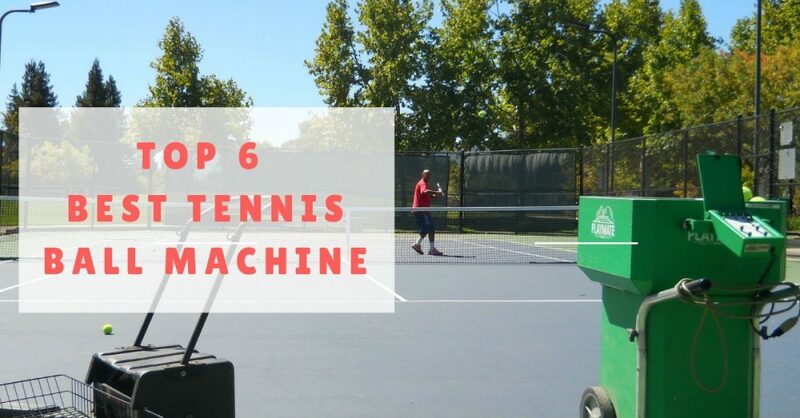 How to use a tennis ball machine? How much does a tennis ball machine cost? 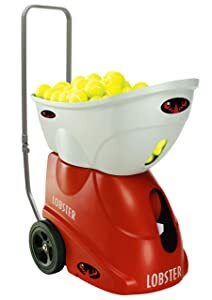 Where to buy tennis ball machine? At first sight, Lobster Sports Phenom II Club Series Machine is indeed a “monster,” with its weight of 99 pounds. But, you can easily pull it to your desired place thanks to its handle and large wheels. Highly customizable and fully programmable, this high-end model permits you to practice to the maximum and tune to your drills. The Lobster Sports Phenom II highlights the Fully Random Oscillation that can throw balls mixing different depth, speed, and spin parameters. A capacity to hold 250 balls is also a HUGE advantage for you to practice for long. The cutting-edge tech integrated is incredible. It’s easy to customize your preferred court drills and avail 18 shot locations while designating the ball elements including feed rate, spin, and speed. So, if you want to turn it into a real opponent, simply set up the court drills. Well, if you’re looking for the high-level machine, this product can deliver the great court experience for sure. Though its high price is not for everyone. As mentioned above, this is the best for both beginners and pros. It does not only improve your tennis skills but also keep your performance at the best thanks to its excellent features. Thanks to the adjusted oscillation like fully random, vertical, and horizontal, you are able to practice any tough movements. For instance, you can establish a 2-line drill at any width/height. Then combine the vertical oscillation with horizontal one for advanced practice sessions. Similar to the Lobster Sports above, the Spinshot is also programmable. Relying on that, you can plan various drills and practice everything that you need to become a great tennis player. Another exciting thing is that you can avail your phone to adjust the feed rate, angle, and speed. This is greatly useful for those who prefer to become more advanced in the game. With affordable price, you can welcome a durable and easily portable machine that is made of high-quality metal. Wonderfully, it features two great options for using either a battery or an AC. And all are included in the cost, of course. 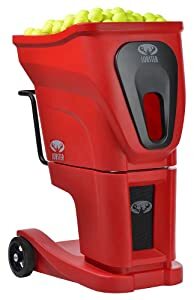 If you prefer the Lobster Sports series yet afraid of its high price, the Elite Liberty here, the top rated machine with price under $1000, is what you need. This product weighs only 35 pounds and comes with frictionless wheels, making it easy to move around. Thanks to an inverting hopper and a folding handle, you can transport and store it with ease. Let’s talk about its spin-control feature! The Elite Liberty from Lobster Sports can easily adjust the back and top spins. Its setting can be controlled -4 for max backspin to +4 for max topspin together flat feed. With a random horizontal oscillation and the ball speed from 20-70 mph, this machine is unable to control how far to the left or right the ball will go. However, it still helps to boost your stamina, agility, and briskness. Thanks to the battery-powered design, you can move it around without worrying about plugs and cables. Even, you can get an external battery pack for maximum playtime. The final best portable tennis ball machine from Lobster Sports is Elite Two. With both vertical and horizontal oscillation, it’s easy to put the balls on both sides of the court by using the one-touch system. If you prefer the challenge, simply choose the vertical oscillation as it offers more choices. An elite 10-function remote control allows you to regulate the ball speed, feed rate, spin, and elevation (up and down). The triple-oscillation feature also simulates a real opponent that can help you improve your skills. The best way to practice is to set up topspin on 60% of your drills, backspin on 20%, and flat on 20%. Relying on that, you can create a live opponent to challenge. Although it’s heavier than the Elite Liberty (42 pounds), you easily move or even lift it to your car and drive it to the court for practice. Additionally, the Lobster Sports Elite Two is described as the best battery power tennis ball machine. With a high-capacity and long-lasting battery, you can spend from 4 to 8 hours on the court without worrying about recharging. For children or rookies, they might not be willing to deal with advanced options from a machine. If you belong to this group, the first thing is to get used to the game and the speed. At this point, it’s okay to turn your attention to the Match Mate, the best sports gear under $500. It features the triple threat elevation, ball delay options, and ball speed with a range from 10 to 28mph. Its heavy topspin also helps to develop your skills and form a better defense. Another remarkable thing is all about its battery. It offers over 5 hours when fully charged so that you can play as much as possible. The Match Mate highlights urethane pitching wheels and the aluminum exterior for maximum durability. Moreover, its internal materials are made from high-quality steel/aluminum, making it last longer than usual. Since this product weighs only 22 pounds, it’s ideal for moving from place to place. If you only want a simple and affordable machine, Isam Extend will be an ideal selection. Indeed, it provides great features and value at a reasonable cost. This device is reliable, versatile, durable, and easily portable. With a big green bucket design, it can hold over 300 balls at a time. Soon, you fall in love with its spin control and ball delivery, offering a controlled and nice topspin and underspin. Featuring 5 levels of elevation control, you are able to adjust the pace of shots ranging from 15 to 70mph. This makes it perfect for semi-professionals or coaches who need an affordable and easily portable machine. The feed rate of the Isam Extend is awesome, ranging from 2-7 balls per second. Even, its quickest firing time is recorded about 1.5 secs while the lowest one is 12 secs. One more fantastic thing is its exceptional battery life of up to 5 hours. So, you play and play without worrying about recharging. Above are the top list that you should consult carefully before choosing the one. But, it will be meaningless if you stop here, find the one, and don’t care other information. You MUST read all the factors to define what you need exactly. From there, you can easily pick up the right one that can give you everything. Here we’re going to show a list of critical factors that are divided into two main groups. The General Features include points that influence any purchase. The Specific Features talk about particular things to the machine only. Do you need a portable one or a big one? How much are you planning to drive with it? Merely check its dimensions and see whether or not it can be folded for easy transportation. You also take into consideration where you want to store it. When it comes to transporting the machine and moving it around, weight is crucial as well. Note that the bigger weight often means bigger capacity. But, in case the weight is your concern, it’s best to find a great balance between it and the capacity. Capacity means the maximum number of balls that your tennis machine can hold. The minimum capacity often contains 50 balls while thehigh-end machinescan carry over 300 balls. Indeed, you should choose the large capacity as it permits to train longer as well as saving time on collecting and refilling the balls. Or you can buy a hopper separately and use it in conjunction with the machine. Relying on that, you can spend more time on actual training. If you decide to pick up the giant machine, make sure it has wheels. Even, you have to consider the wheels for the small one since it allows you to move the machine around with ease. No one wants to carry a cumbersome device, of course. Additionally, you must examine the size of the machine and the wheels. Some bigger ones with the small wheels will not do their job well when it was full of balls. Since the ball machines can welcome debris in the air or be exposed to wind or fog, you need a polishing machine made of plastic or heavy metal. This ensures your device work well in the long run. Whenever purchasing any product, you should be sure it’s well-protected from any construction flaws and production faults. Most of these machines come with a 2-year warranty, which should be enough for moderate use. Besides, you find some warranties that offer free services to support you anytime. Getting a good warranty makes your life easier. Depending on the brands and features, a tennis ball machines often ranges from $500 to even $10,000. The budget-friendly models are often under $1,000. The mid-range ones are between $1,000 to $2,000. If catching any machine with a price higher than $2,000, that means it’s thehigh-end model. Before buying, you need to assess your budget because it’s a permanent investment. Propulsion indicates the way the tennis ball machine will provide the balls. It includes two main types of ball propulsion including spinning wheel propulsion and air pressure propulsion. 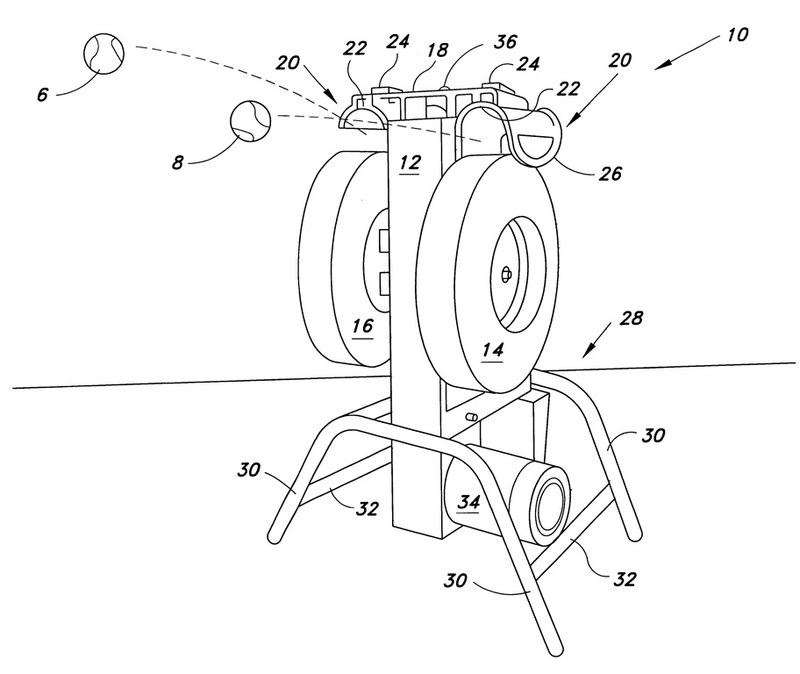 The spinning wheel propulsion has two counter-spinning wheels inside that rotate with a particular pace to dispense the ball and fire it around the court. To adjust the speed of these wheels, simply direct via the main control panel. This one is commonly found on the mid-to-high model because it permits you to spin the ball, creating more challenges while practicing. Meanwhile, the air pressure propulsion uses air pressure to shoot the ball through a special tube. Since it consumes lots of power to do, it mainly runs on the AC power instead of using the battery. And this kind is often featured on the budget models. Random – the device will decide where to feed the ball itself via a random algorithm. Programmable – you can set a particular practice routine that fit for your training goal. It’s best to get the machine with programmable oscillation because it gives you more challenge and variety when practicing. Elevation means how high and low the tennis ball machine can feed the balls. If you need a more dynamic feed, make sure you notice this feature. With two types consisting of manual and electric elevation, if you want something user-friendly, you should opt for the electric one. How slow and fast can the machine fire tennis balls? If the upper-speed limit is not high enough, pro players will get bored soon because the speed of the balls is not challenging to them. In case the lower speed range is not low enough, rookies will meet a tough time to control the ball. The speed often ranges 10-95mph on the high end. But before buying the tennis ball machine, you need to assess your skill level. Maybe, you don’t need a very high shooting speed range. As a new tennis player, a range between 10 and 50 mph will be a good choice. How quickly does the tennis ball machine feed the balls? The quicker the feed rate is, the more you will improve. That means you can enhance your reaction to the incoming ball. And at the same time, you can hit more shots in a certain amount of time. The advanced players often look for the machines that can feed the balls fast. Meanwhile, the beginners need more time between shots because they don’t hit the ball as hard. Feeding interval means the intensity that you’re going to get the balls. For example, some machines offer the fixed intervals as 3, 6 or 12 seconds. Meanwhile, some permit you to set a range between 1 and 60 seconds. The tennis balls machines can be either battery-powered or AC-powered. At first, the AC power is not our recommendation since not all courts provide a power source available. Even, it’s a bit tough to deal with the power cord. We prefer the battery-powered machines because they are ideal for move around and convenient than the AC powered ones. The only issue is that the battery life is limited. Some only allow you to play about 3-4 hours straight. The remote control is often expensive and needs to be bought separately. However, it’s a great extra if you are going to control the machine from afar. Or your coach can change the workout routine without notifying you. Relying on that, you can welcome occasional curveball and keep you on your toes. Since you will be overwhelmed with different kinds of items, we only focus on two names that are helpful at this point. Down here to know now! The pressureless tennis balls come with a solid rubber core and are a bit heavier than the pressurized balls. These balls have less bounce, so they are an excellent choice for beginners, intermediates, and those who are practicing with the ball machine. Thanks to the fuzzy fabric, they can last for long. So, which product will be the best choice at this point? 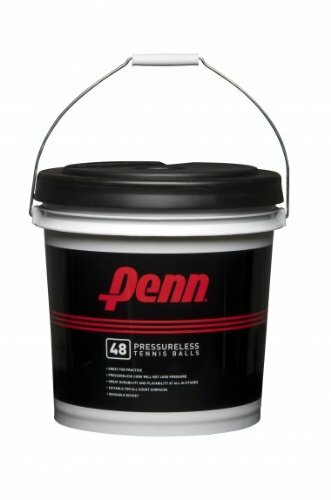 In our opinion, you should opt for Penn Pressureless Tennis Ball. It’s a big bucket with 48 balls that are perfect for a practice session with the ball machine or any hitting partner. These balls are made with high-quality felt construction, offering a smooth feel while playing. They satisfy Penn’s usual high standards as well. Last but not least, its plastic bucket is sturdy, reusable, and convenient with a carrying bundle for easier transportation. As its name suggests, this accessory is made for picking up, carrying and storing the tennis balls. The hoppers are made of lightweight graphite so that you can carry it around. They are also weld designed with a diamond-clad to help in weather resistance. And after every use, you can dismantle and park it with ease. Let’s introduce Gamma Sports Premium Tennis Teaching and Travel Baskets! 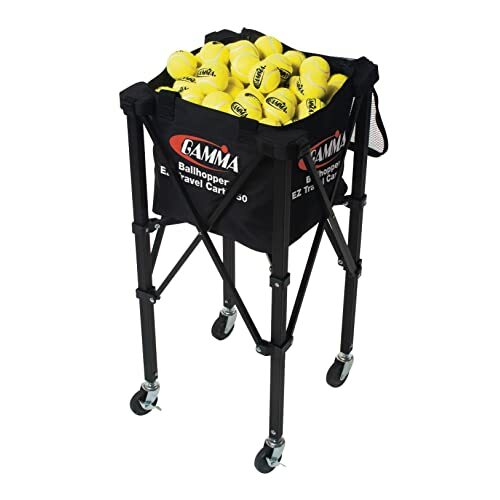 This tennis ball hopper features a unique foldable design that can hold 150 balls for a practice session. It’s crafted with steel wire inner frame and processed with powder-coating for high endurance. That’s why it’s robust yet lightweight so that you can maneuver within courts with ease. Thanks to the removable handle and foldable design, you can store all in an EZ Travel Cart and then put into your car comfortably. Wonderfully, you receive a full money back guarantee if feeling unsatisfied. Drilling on the tennis ball machine can be an exhausting yet a fun and rewarding experience. And if done accurately, these drillspermit you to continue perfecting a specific stroke or piece of your game. Practicing the doubles alley drill is good for consistency. First of all, you need to put the machine in the middle of the doubles alley on the other side. Then set it to shoot nice and slow balls. When the machine shoots the ball, you need to turn sideways with your chest and hips to hit. Make sure you are side on even though you’re opening up. To improve the consistency, you need to follow that shot as you make your fall through. From there, the momentum of your body will move right down the doubles alley. And this allows you to return all the shots on the other side accurately. As beginners, it’s best to practice 5 in a row. While 10 in a row is suitable for intermediate, 15 will be great for the advanced players. Let’s set up the machine at the cross-court so that it can feed the shot to your forehand side cross-court. Start hitting the shot back and try to perform as much as possible. As a beginner, you need to perform 3 times on the forehand side. Then switch the cross-court to the backhand and repeat the process about 3 times. Performing the forehand/backhand cross-court allows you to determine how much muscle power you are using. By returning the powerful shot, you can puzzle your opponent in a real match. The backcourt drill is known as one of the easiest exercises to practice. Moreover, it brings a significant effect when playing in a match. It’s because when you get your shots to land as close to the baseline as possible, you will put a bit of pressure on your opponent. It will push him/her back, and then he/she almost gets jammed up. To make sure that these balls land deep on the other side, you need to get a little extra power. Then get a good full shoulder turn. That means your shoulders are going to rotate back to get more power. When you’re coming through, you need to accelerate through the ball and transfer your weight forward. This helps you to get all the shots deep and close to the baseline. Sometimes, you hit the ball into the net or hit it too high and too far out of the court. That means you have to practice the ball placement and its trajectory. The low trajectory needs to have a distance of about 4 inches between the ball and the net. To perform the lower shots, you need to brush your racket up from low to high and then hit through the ball. Or performing the angle between 200 and 300 is ideal. The high trajectory must be about 5-9 inches above the net. Instead of having the racket face forward, you need to turn it vertically. Let’s brush up an angle of 60-700 to help you hit the ball high! The final training in our top 5 drills is to perform both footwork and cross-court drill. Start dividing the backcourt into a little box in the corner. Then put a pile of balls or cones on the sidelines to shape a nice square, offering a good target to hit. Next, start with your forehand, hit the ball in the corner and switch over to your backhand to perform another shot. Make sure you get five good shots into each side and alternate back and forth between each shot. That’s all for top 5 drills that you can practice with your ball machine. Remember to read each carefully and perform as much as you can to enhance your skills. Most of the tennis ball machines on the market run via using the counter-rotating wheels. As the machine is turned on, an electric fan pulls in the air outside and then pushes into the canister. And to protect the fan motor from debris, the air comes through a board of foam and a screen barrier. Meanwhile, an electric motor-powered hopped is availed to direct the balls into the landing area. During this process, the counter-rotating wheels will squeeze the balls and put them under extreme pressure. Then force them into a circular tube that leads to a small opening. A soft and resilient circular area is called as a detent (a mechanical locking device). As the ball is lodged here, it forms an airtight seal at the end of the tube. At the same time, a plastic flap drops over the entrance and causes pressure to mount. After that, the air pressure pushing on the ball crushes resistant from the detent. And it makes the ball the shoot down the barrel and onto the court. When the pressure has been delivered, the entrance flap is also released, and another ball enters the tube. The process continues happening again until all balls are empty. 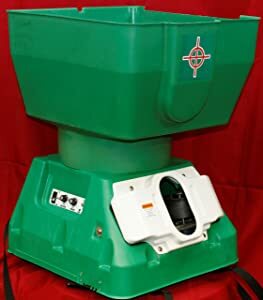 If you’ve ever used this machine, you will have noticed that the depth, height, spin, and angle of the shot can be controlled to fit every player’s preferences. For instance, if the upper wheel is spinning quicker than the lower wheel, the machine will create topspin. Otherwise, backspin will be created. But, how many benefits exactly? Let’s talk about again, guys! First of all, you will have a training partner “who” is always available. With the ball machine, you can go out and practice whenever you want without worrying about scheduling someone. The next one is that you can improve game by concentrating on particular strokes you need to improve. Do you want to practice your forehand or backhand, overhead or volley shots? This machine can help you all. Wonderfully, you can change to any stroke or drill without asking or negotiating with anyone. Everything you can do is to focus on what you want to improve. Since delivering the consistent shots might be hard to replicate with a hitting partner, you need the tennis ball machine to perform. Not only will it permit you to place the ball to the backhand or forehand but also feed your lobs. And it will never get tired of feeding you the same shot again and again. You’re free to adjust the speed, spin, height, and direction, guys. In case you need to practice hitting backspin or topspin shots, you simply control the settings to pass the balls with backspin or topspin consistently. By adjusting the speed, you can stimulate play against the strong hitting opponents. Or play a drop shot with backspin or choose to lower the speed to practice approaching the net. The chances are limitless. By repeatedly practicing with the tennis ball machine, you are able to concentrate on your form. Note that it’s essential because it creates natural reflexes and muscle memory. But, as beginners, you need the help of a professional instructor or coach so that he/she gives important feedbacks of your form. Once you get a good base, the machine makes sense. Except for improving your tennis skills, practicing is right for your health. If you are going to burn some calories, working with the ball machine is great. According to HealthStatus, if a 150-lb person plays tennis in an hour, the number of 414 is his/her calories burned amount. Meanwhile, a 190-lb person can burn 524 calories if practicing in an hour. As you know, using the tennis ball machine helps you master your shots as well as practicing different tactics. If you are a rookie, you need to practice different drills (we mentioned above) and remember to take breaks if necessary. And don’t forget to prepare two hoppers full of balls. To advanced players, it’s best to practice one drill without taking a break. Additionally, you need to improve your deep central shots and corner shots. It helps to make your opponent move farther away and feel tired soon. Generally, you should practice at least three hours or four to five hours in a few times of a week. Depending on your ability, you can increase or decrease the intensity. Soon, your tennis game has improved significantly. The tennis ball machines’ prices can change considerably. And all depend on which model you are looking for, simple or advanced. The price often ranges from 500 – 5000. Even, you can find the machine over $5000. For instance, Playmate Genie is known as the most expensive tennis ball machine out there. So, how to get affordable deals when it comes to buying this machine? One of the simplest ways is to wait for BIG occasions such as Black Friday or Christmas. If purchasing on these days, you get incredible sale-offs for sure. Nowadays, most people opt for buying online to save time as well as money. Just access popular websites such as Amazon, Walmart or eBay, and then you can get everything you want. One of the most wonderful things here is that you can compare the price to get a good bargain. And don’t miss the subjective feedbacks from customers to decide better. Once again, we want to affirm that buying the best tennis ball machine will make a difference. 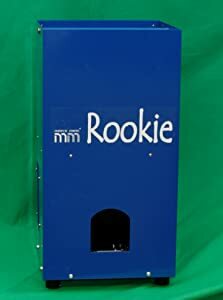 No matter who you are, a newbie or an avid player, this machine is necessary to help you practice the techniques and moves you want to improve. Even, you can enhance your speed, learn how to control your racket, and more. 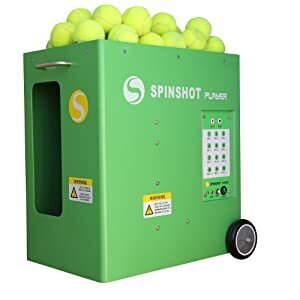 From our reviews of top 6 above, we would highly suggest the Spinshot-Player Tennis Ball Machine with Phone Remote Supported. This machine is light and compact, making it portable to move around. It also includes the best features so that you can use to practice difficult movements with the racket as well as learning more drills. Best of all, you can program the speed, feed rate, and angle via using the smartphone. And its price is quite affordable for both beginners and pro. If you agree with us, ORDER now! Or you can reread to find the one you want most. Frankly, we would like to thank for reading. And remember to SHARE this article to anyone who is in the same situation as you. thank for your reviews. I am finding the best one for my kids! How to Hit a Tennis Ball Correctly for Beginner?